Some Roofs Vulnerable to Leaks After Hail Damage | The Voss Law Firm, P.C. ?Will the insurance company cover both roof and water damage caused by hail? ?When should I start repairs after a hail storm? You want your clients to be happy with the job you do for them after a hailstorm, and that means making sure that you’ve covered all the bases and identified all the damage. 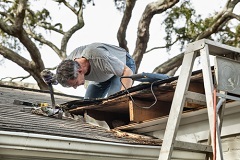 If you miss a torn seam or cracked shingle, it could mean that your client ends up with leaky roof or wet attic just a few months or years down the road—and they’re probably going to blame it on you. Shingles. Whether they’re asphalt, tile, slate, metal, or wood, shingles are probably the most popular roofing material in the United States. Unfortunately, they can also hide hail damage or the extent of the repairs that are actually needed to protect against leaks. It’s important to look for lost granulation, gaps, damage to seams, curling, distortion, and other little places where moisture could seep under the shingles or mat. Asphalt and pitch. If the roofing material is damaged, it can allow water into the underlying fiberglass felt or open the door for accelerated deterioration. Once water has seeped inside the insulation, it can rapidly spread damage across a much greater area than seems possible from the size of the fracture on the outside. Modified bitumen. Modified bitumen roofing may not seem very vulnerable to a few hailstones, but hail can cause surface fractures or even damage the membrane. Often, hail damage is impossible to spot from the outside, and core drilling may be necessarily to assess the true extent of the harm. Gravel. Gravel roofing can be very resistant to hail damage, but it certainly isn’t immune. Unfortunately, the gravel can also disguise damage or the initial point of damage, meaning it isn’t discovered until a leak has already developed and become a big problem. Be sure to check gravel roofing very carefully for potential hail damage. Metal. Hail damage to metal roofing can depend a lot on the gauge of metal used and whether or not it has a pressed texture. Along with the usual dings and dents, it’s worth looking out for damage to interlocking seams, end trims, caps, and other areas that might allow water to leak into the substrate. Sprayed polyurethane foam (SPUF). SPUF is becoming more popular, largely because of its hail resistance. However, SPUF roofing still needs to be carefully checked for fractures. While it may take longer to develop a leak than other roofing systems, the eventual damage can be both extensive and expensive. Are you worried about a denied roof claim? Contact us today at 1-888-614-7730. Our attorneys have decades of experience fighting unfair insurance claim denials and getting difficult claims paid in full.